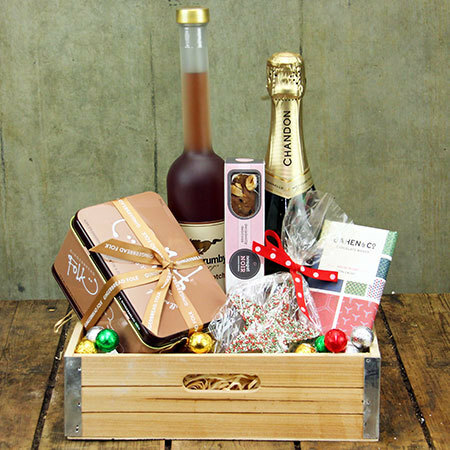 This nordic-inspired Xmas hamper is presented in a timber crate and features Wild Brumby Gluhwein locally distilled in the mountains of Jindabyne. Served warm, this European style alcoholic beverage is made from pink lady apples, wine & traditional European spices (contains 17% alcohol). 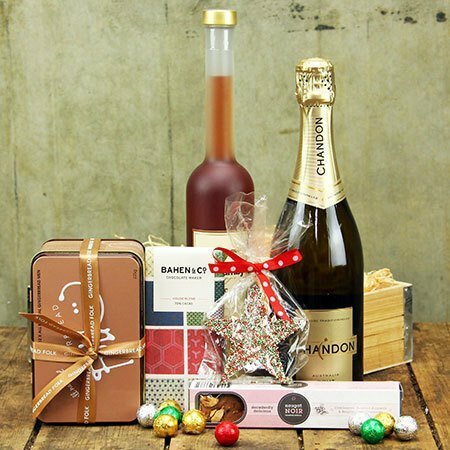 Further Christmas treats include a bottle of bubbles; gift tin of gingerbread folk made locally in the Blue Mountains; delicious nougat; a Kennedy & Wilson chocolate star; and Bahen & Co 70% cacao chocolate ground from bean to bar on a family farm in Western Australia`s Margaret River. Order this delectable Xmas hamper online or give the Flower Elves a call on 1800 66 66 46. *PLEASE NOTE: Xmas hampers delivered Sydney only. Hamper available for delivery after 16th November. 2019-04-26 Disappointed with flowers as they were not fresh, Sent an email right after my wife received them but still waiting for any action to be taken. 2019-04-26 Service rating : Your webpage was user friendly and had a good description of what we could expect from what we were purchasing. Everything was very straight forward, I liked that I was sent a text message to confirm delivery. Product : I didn`t see the end product so I can`t really rate them. They were for a family of a fellow co-worker who had passed away.